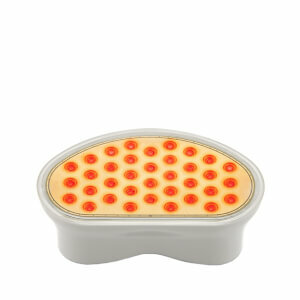 Rediscover a younger, firmer-looking complexion with the NuFACE Trinity Facial Toning Device. Combining a facial toning device with a skin-prepping primer, the duo will contribute to a smoother, lifted and younger-looking complexion with regular use. Trinity Facial Toning Device is FDA-Cleared and clinically tested. An award-winning microcurrent treatment packed into an innovatively-designed device with interchangeable treatment attachments. Designed to combat visible signs of ageing, the device stimulates both the large surface areas and small contours of the face, creating similar results to a facelift, however the treatment is pain free and can take only 5 minutes. Microcurrent devices mimic the natural current of the body, which slows as we age. Going deeper than the surface, the device visibly tones the facial muscles, improving the contour, evening the appearance of skin tone and visibly reducing fine lines and wrinkles. Safe and effective for all skin types, it leaves the complexion looking youthful and visibly supple. Use the NuFACE Device at least 5 times a week for the first 90 days. After that, use 2-3 times a week to maintain results. Start by washing your face with an oil-free cleanser. Men should shave before use as hair can interfere with the conductivity. 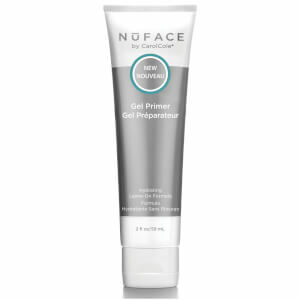 Apply NuFACE primer. Glide along the natural contours of your face, in an upward motion. Each glide should last five seconds. Repeat three times. Remove the NuFACE Primer with a warm, damp washcloth. Apply your favorite NuFACE Serum (optional) and preferred moisturiser. Primer: Water, 1, 2 Propanediol, Acrylic Acid Polymer, Caprylyl Glycol, Methylisothiazolinone, Cellulose Polymer.